Hilton Dalaman Sarigerme Resort & Spa is a luxury, family-friendly hotel on the Aegean coast of Dalaman in Turkey. Nestled between magnificent mountains and the Mediterranean, the hotel provides the perfect break for a sunny Aegean holiday. The 410 elegantly designed rooms come with all modern amenities and offer charming views of the mountain or sea. Relax in its fabulous spa, indulge yourself at any one of the 23 bars and restaurants, take a splash at the waterpark or simply lie in the sun on the hotel’s private beach. Hilton Dalaman Sarigerme Resort & Spa has all the amenities to make your vacation a memorable one. The small village of Sarigerme has a certain laidback charm to it and can be explored on foot. Located on Sarigerme beach in Dalaman, Hilton Dalaman Resort & Spa Hotel has a private beach. The town of Sarigerme is just a 10-minute walk away. You could also watch Caretta turtles at Iztuzu Beach nearby. The nearest airport is Dalaman, which is situated at a distance of 18 km. 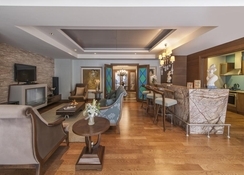 Hilton Dalaman Sarigerme offers well-furnished rooms, which are tastefully decorated. The air-conditioned rooms have either sea or mountain views. These spacious rooms come with well-furnished balconies, satellite TVs, showers, mirrors, ironing boards etc. Various categories such as twin rooms, superior twin rooms, family rooms and deluxe double rooms are available. Both room-only or all-inclusive options are available. 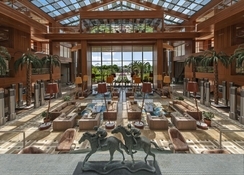 Hilton Dalaman Sarigerme Resort & Spa has a main buffet restaurant, which serves Turkish and international cuisine. There are other a la carte restaurants offering Asian, Turkish, Italian and seafood delicacies. 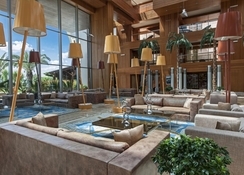 Several bars, including a rooftop cocktail bar, a modern wine bar, a lounge bar, a Raki bar and a pool bar, which serve delicious drinks and snacks, are present in the hotel premises. 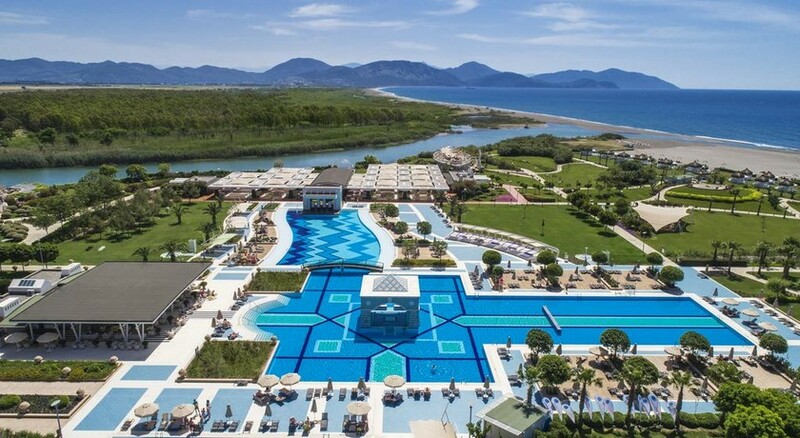 Hilton Dalaman Resort and Spa has as many as seven outdoor pools, along with a few for kids and a few indoor ones. 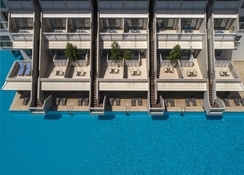 Sun terraces, interconnecting gardens, a private beach and water sports options make the hotel a hotspot for leisure-seeking travellers. The resort has facilities for sport such as tennis, basketball, beach volleyball, billiards, mini football, table football, golf, table tennis, aerobics, gymnastics, darts and yoga. The spa has options for relaxing massages, therapies, Turkish baths and a fitness centre. Deluxe Room (Swimup/Pool Terrace) room type description is "Deluxe Room Swim up POOL VIEW. 56 sq. m./606 sq. ft., direct pool access, private terrace, 40-inch LED TV, WiFi. These stylish rooms are located on the ground floor and offer direct access to the swimming pool from your own private terrace with sunbeds. Enjoy the comfort of two king beds plus a sofa/armchair. The elegant bathroom has a bathtub, shower and separate toilet. Amenities include a 40-inch LED TV, MP3 player, pillow menu, WiFi and laminate flooring. Standard Room Sea View (Swimup/Pool Terrace) room type description is "GUEST ROOM SEA VIEW POOL ACCESS VIA STAIRS. 34 sq. m./366 sq. ft., balcony, direct swimming pool access, separate tub, shower & restroom. Decorated in a modern style, our 34 sq. m./366 sq. ft. Guest Room with Pool Access offers comfort and privacy with amenities to make your stay peaceful. 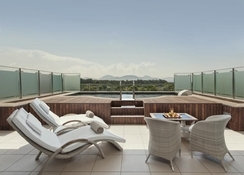 Lounge on the balcony then take the stairs down for a dip in the pool. This room features a king-sized Serenity bed and a sofa or armchair. Refresh in the bathtub or shower. Enjoy a show on the 32-inch LCD television or music on the MP3 player radio-alarm clock. Other amenities include WiFi, a pillow menu, tea and coffee making facilities, iron and ironing board, and a carpeted floor. Everything was to the top even when it’s not the staff members are always helpful. We visited this hotel during the October half term, for the end of the season, the hotel was fairly busy but not overcrowded. The food was exceptional and there was a wide variety on offer each day at each meal time. During the day there were many activities to participate in for all the family from the morning bike ride, archery, chess, snooker and much more. The Kids club and Art club kept my 7-year-old daughter busy for most of the holiday. We also went on an excursion which we booked through the hotel for a day - it was a relaxing boat ride and also included a visit to a Turtle farm and beach. I would highly recommend this hotel and this is the second time that we have been to this hotel. It is exceptionally good value for money, rooms are spacious and modern and the staff are lovely. 10/10 everytime.